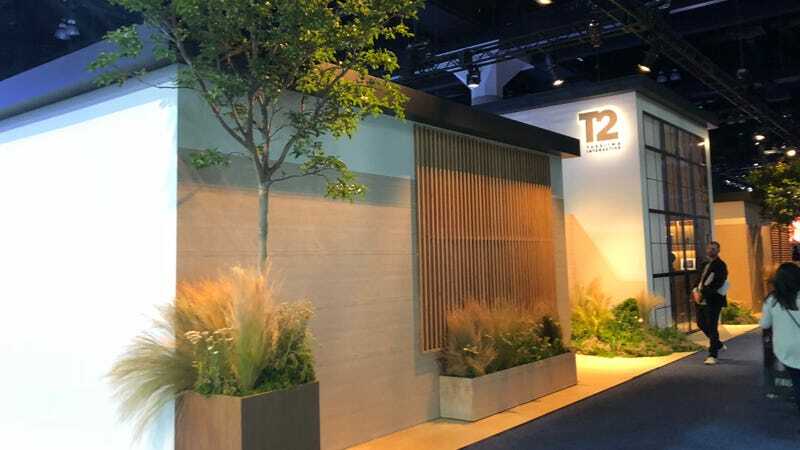 The Take-Two booth at E3 makes all other publishers look sweaty and sloppy. No insult to the others, really, because they’re just doing what game publishers do. They’ve got their games and their logos and their trailers and lines of people wanting to play stuff. Take Two’s got four walls of serenity. And make no mistake, the Take-Two booth is massive. Look how deep this goes. So what’s going on here? Is this just a power move by Take-Two, given that they’ve got the game this fall that everyone else is sweating? Maybe, but I understand that Take-Two has done these kinds of game-free chill booths before. Even the people who’ve been to them tell me that, no, it’s never been quite this chill. Not only are there no games or game signage outside—no demo kiosks, no screens, nothing for Red Dead Redemption 2, NBA 2K, or WWE 2K—there’s no sign of those games if you go inside. I did find a room that had an Xbox One S that was running copies of last year’s NBA 2K and WWE 2K games. The other game on it? Electronic Arts’ Madden. The luxurious space behind the glass doors is full of comfy chairs and crate myrtle trees. There’s a bar serving fancy tea. It’s all set under a set of monitors that put a blue sky overhead. I was told that sometimes a plane flies overheard. Sometimes a bird. It’s so relaxing, and such a contrast from the rest of E3. It’s a wonder why anyone would leave it. Going by this space, Take-Two is currently pretty zen. I guess they’re feeling good and confident.